Johnny Sauter if expected to return to ThorSport Racing to continue his NASCAR Gander Outdoors Truck Series career, a RacinBoys.com report by Lee Spencer, citing unnamed sources, claims. He is expected to drive a No. 13 Ford for the team. Sauter lost his ride at GMS Racing after the 2018 season, days before Brett Moffitt was announced as GMS Racing’s latest hire as driver of one of the team’s other trucks. The No. 21 GMS entry formerly driven by Sauter will not be fielded in 2019, the race team claims. Sauter had been a driver for GMS since 2016, winning the Truck Series championship in his first season with the team. In 2018, he matched Moffitt in wins with six. 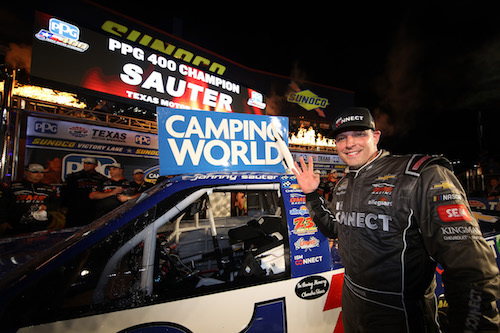 Before moving to GMS Racing, Sauter was a driver at ThorSport Racing since 2009, his first full-time season in the Truck Series. In all, Sauter has 244-career starts in the series, dating back to 2003, resulting in 23 wins, 102 top-fives and 157 top-10 finishes.